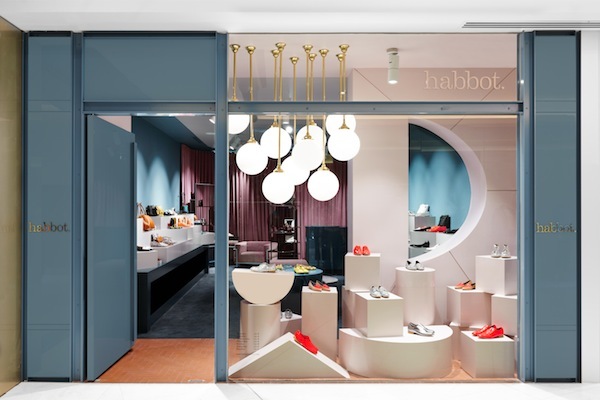 “Shoes are very sculptural and so I think the 3D aspect to a shoe shape really fascinates me,” says Habbot founder and designer Annie Abbott. “More specifically I get very focused on the toe shape, and second to that, the heel. I can spot a toe I like at 100 paces!” The Australian designer says men’s shoes have the best toe shapes and so most of the shapes in her designs are based on classic men’s almond and chisel styles. Annie designs every collection from her Melbourne office while she works with a production team in Italy, where the shoes are made. 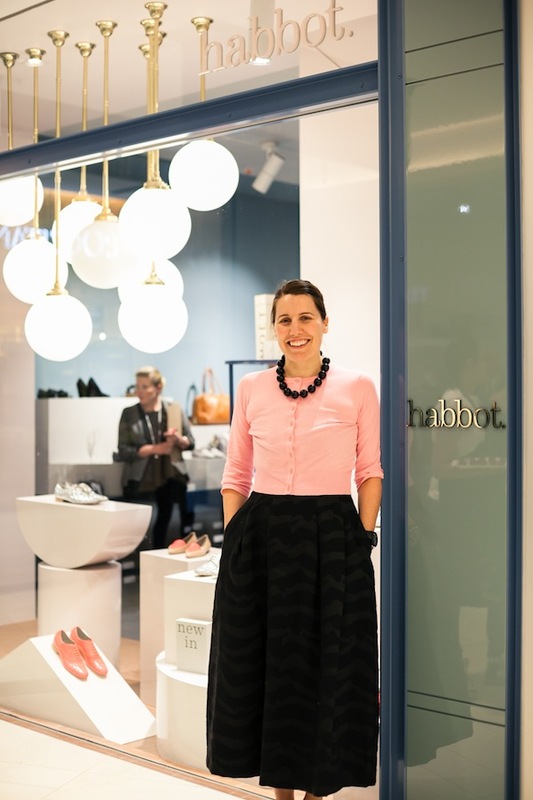 She launched Habbot’s debut Autumn Winter collection in February 2011 after starting her career at Net-a-porter.com in London, where she worked on the buying team. Annie also worked in a business strategy role at Sass & Bide in Sydney. Now she is focussed on Habbot, and has three stores in Melbourne. “As soon as we had customers who started coming back for their second and third pair in our first retail store three years ago, I felt we’d turned a corner,” Annie says. The latest collection - Winter 2015 - was shot by Mike Baker and styled by Heather Nette King (interview here). The Strand Melbourne store, pictured above, was designed by Fiona Lynch (interview here). Which five words best describe you? Persistent, single-minded, positive, colourful and unfit! How did you get your career start and what path have you taken since? Being in the right place at the right time. I took a one week temping job with a young Net-A-Porter in London and one of the foundering directors was Australian and she recognised my Aussie work ethic and affinity with numbers. She took me on to help the buying team analyse buying patterns of their growing customer base and one week turned into three incredible years on a very steep learning curve. Since then I’ve worked at Sass & Bide in Sydney when they needed an analyst to work across all departments and it was here that I learnt about the design and production process. I moved back to Melbourne to learn the ropes of the shoe trade and after five years of doing so, I took the leap into self-employment. What’s the best lesson you’ve learnt along the way? To sleep on a problem and not to make rash decision to solve it. I’m used to living with a level of uncertainty now and am not thrown by unexpected events like I was a few years back. What’s your proudest career achievement? Every time I sell multiple pairs of shoes to complete strangers who just have to have them! Followed closely by seeing my shoes grace the runway at the Royal Botanic Runway last year in Melbourne’s Royal Botanic Gardens. It was simply the most amazing show and in such an incredible setting. What’s been your best decision? To change direction from a wholesale focus to a retail model, which happened in season three of the business. Who inspires you? The girls I work with. They are a very smart bunch with great individual style and get very excited about what’s coming next so it makes me want to wow them with every new shoe I bring out. What are you passionate about? Bold colour. Individuality. Non-disposable fashion - ie, buying less and buying better. Which person, living or dead, would you most like to meet? My grandmother. She was the one who instilled in me grand ideas about quality, colour and design and I’d like to show her what I’ve come up with. What dream do you still want to fulfil? I would like to complete the circle and sell my shoes on Net-A-Porter.com. I would also like to become competent in the kitchen overnight! What are you reading? I always have two books on the go – one for pleasure and one for work. So at the moment I am reading Before I go to sleep by SJ Watson and also The inner game of work by Timothy Gallwey. Most nights I fall asleep only a few pages in so its very slow going!